Following our delicious lunch with KEPCO employees, we boarded our bus for a 2-hour journey to the Demilitarized Zone (DMZ). 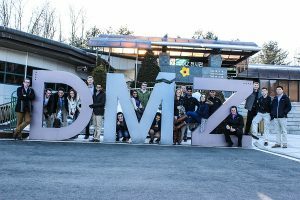 The DMZ serves as the 4km wide buffer zone between the 38th parallel that separates South Korea and North Korea. 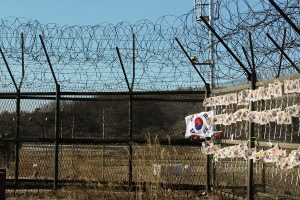 Contrary to being demilitarized, the area is heavily secured with endless lines of barbed wire and military watch towers. Our tour started at a visitors area where we were able to see the Bridge of Freedom that was used to trade POW’s at the end of the Korean War. Although the existing unification bridge is shut down to all traffic, South Koreans are very optimistic and hopeful that they will be reunited with their neighbors to the north. In fact, many South Koreans have friends and family in North Korea that they have not had contact with in years. The footbridge is used as a place of remembrance for families that are separated. 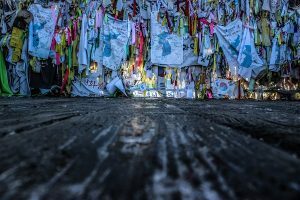 As seen in the photo below, many South Koreans visit the site and tie colored ribbons with messages to the locked gate for their separated family members or in remembrance for their family and friends killed in the war. Just next to the bridge are the remains of concrete support towers for a rail line that was destroyed during the Korean War. The visitors area also contained a large steam locomotive that was attacked and derailed. The story of the locomotive is that it was in the way of the Chinese Communist Forces trying to deliver war materials to North Korea. The locomotive was derailed and destroyed at Jangdan Station with more than 1,020 bullets. Next, we headed over to visit the Third Tunnel of Aggression which is the name given to one of the four tunnels that the South Koreans intercepted from the North Koreans. After the Korean War, the North Koreans drilled numerous tunnels heading toward South Korea in hopes of issuing a surprise attack and taking over the entire peninsula. 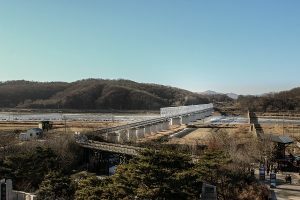 The tunnel was discovered in 1978 based on information provided by a North Korean defector who claims that there are numerous other tunnels that still have not been found. This tunnel spans 1.6km (1 mile) at a radius of about 2m (6.5 ft) and has the capability to infiltrate 30,000 soldiers per hour. Unfortunately, photos were prohibited in the tunnel and we began our trek by putting on hard hats designated for tourists entering the tunnel. Having left our GLCM hardhats at the hotel without knowing they would be needed, we reluctantly put on the bright yellow ones. It was within minutes that these hardhats came in handy as every step or so you would hear the clank of someone hitting their head on the rigid rock above us. The 73m (240 ft) deep tunnel is dark and narrow, and we had to constantly watch our step for the damp ground that we were walking on. After the mile hike, we reached one of three concrete barriers that were poured to keep the North Koreans from using the tunnel. The meter thick barrier contains a window where you can see the second barrier about 15 feet away. In between the barriers are explosives and a monitoring system. After a few minutes of taking turns looking through the window, we embarked again on the mile-long hike out of the tunnel. It was not until we had to scale the 11 degree infiltration tunnel that we all realized we were out-of-shape. Climbing out of the tunnel was definitely more challenging and took much longer. Luckily there was a souvenir shop at the end of the tunnel where we found Professor Young’s favorite refreshment, Mountain Dew.